Potential residents looking for real estate in Atlanta are often drawn to the vibrant Downtown region, and for a good reason. Downtown Atlanta sits at the heart of the city, surrounded by Georgia’s top universities, historical landmarks and thriving companies, with plenty of properties to explore in between. Known as the main business district, the Downtown area houses multiple Fortune 500 companies as well as dozens of small businesses. All of the concentrated chaos from commuters and students is balanced out, however, by the art scene and outdoor havens located nearby. The abundance of apartment rentals and the close proximity to several universities makes Downtown a hotspot for college students. The district is sandwiched squarely between the Georgia State and Georgia Institute of Technology campuses, with several bars, restaurants and hotels in between for visiting families. Other local colleges here include Emory, Clark Atlanta University and Morehouse College. 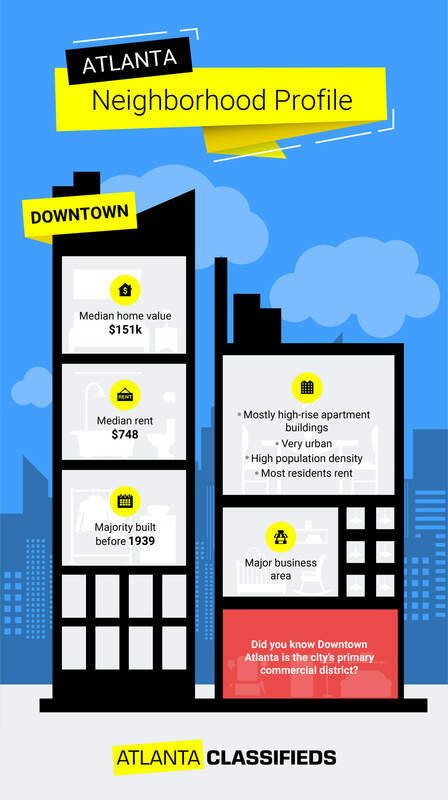 In addition to student housing, most Downtown properties are in high-rises and other similar locations. Potential residents are more likely to find single family homes farther away from the main business district, in the surrounding neighborhoods. The most common listing is a condo or one bedroom apartment. With the help of the Metropolitan Atlanta Rapid Transit Authority (MARTA), students and commuters alike find it easy to travel this area of the city. In addition to dozens of bus routes, the Blue, Green, Red and Gold train lines all run through the Downtown area, making amenities easily accessible and easing traffic in the city center. Tips for renting an apartment or buying a home in Downtown Atlanta, GA. This district also boasts one of the most walkable neighborhoods in Atlanta, Centennial Hill. Homes here put residents within walking distance of most of the district’s top attractions, including a park at the very center. The Peachtree Center Mall is also close by, offering three stories of restaurants and shops, including both well-known favorites and small boutiques. In any case, it is important to keep in mind that Downtown tends to have higher property crime rates than other districts. As always, make sure to stay alert and keep your belongings well secured while enjoying the local activities. Sports fans who make their homes here also find several activities Downtown, as this is where Philips Arena and the Mercedes Benz Stadium are located. For college football fans, this stadium is where the annual Peach Bowl is hosted. Residents can catch a few games and cheer for the Atlanta Falcons or the Hawks, or head farther south to the Georgia State Stadium to watch the Panthers play. On top of that, the national College Football Hall of Fame is situated just down the street from the stadium. Visitors learn about the greatest players and historic moments in the history of college football, or attend special events at the indoor playing field. Amidst the condos and businesses, Downtown has its own unique restaurant scene. In this fast-paced environment so close to big sports venues, bars and pubs fill the spotlight. Along with popular chains like Hard Rock, local eats such as Der Biergarten and STATS are popular gathering places to catch a game and have a beer. Other trendy scenes include a password-protected speakeasy known as the Red Phone Booth, as well as The Sun Dial and Polaris, which both offer breathtaking views of the city. Unlike the suburbs of Atlanta, the Downtown area has lots of activities to experience. Of all the attractions and amenities available to residents in Downtown Atlanta, there are a few favorites that bring return visitors. Centennial Olympic Park – This is a favorite spot for many locals. The Centennial Olympic Park was the site of the 1996 Summer Olympics. Residents come here to enjoy the warm weather and check out weekly events. In addition to annual festivals, concerts and other outdoor activities, this park now houses many of the other attractions on this list. CNN Center Studio Tours – A major hub for this news company, the CNN Center located Downtown is where several programs are filmed each week. Visitors can sign up for a guided tour through the studio and watch news segments as they are filmed. Georgia Aquarium – This is the largest aquarium in the world. Millions of visitors travel to the city to explore these facilities, which include massive tunnels of clear glass for a truly immersive experience. The aquarium hosts monthly activities and educational tours throughout the year for locals and tourists to enjoy. World of Coca-Cola – This massive museum is dedicated to the history of Coca-Cola both as a company and an internationally beloved drink. It includes artwork, a tasting room for visitors to try over 60 different recipes of Coke, and the famed secret vault which holds the original formula.